We are instrumental in bringing forth an extensive range of Grooved Rubber Pads for the customers. Our professionals can design these Grooved Rubber Pads to make shapes that can also be die cut as per our client’s demands and specifications. These Grooved Rubber Pads are extensively demanded by automotive, electronics, defense and other industries. We engaged in manufacturing and export of exclusive range heavy duty railway components like Grooved Rubber Sole Plates. 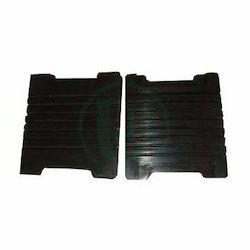 These Grooved Rubber Sole Plates are made from the high quality rubber and plastic to reduce the shocks of vibrations of a passing train. 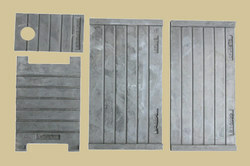 - Grooved Rubber Sole Plate (conventional). - Nylon Rein-forced GRSP for Bridges and Girders. Alfapolymers is a reckoned firm committed to manufacture Grooved rubber sole plates to our renowned customers. Quality we deliver is unmatched and able to experience all the weather and heat transformations. Drg No: T-3711, T-3703, T-4614, etc. Our developed range of grooved rubber sole plates is very effective to reduce the shocks of vibrations caused by the trains while passing through the tracks. With robustness, long service life and effective use these plates are highly demanded in railways. We are highly acknowledged organization engaged in presenting remarkable range of Grooved Rubber Pad. Used for 60 kg. rail pad. We deal in Grooved Rubber Sole Plates. We are the manufacturer of Grooved Rubber Plates. These Grooved Rubber Plates are made up of high quality of raw material. in different shapes, sizes, lengths and finish to suit the requirement. Our developed range of grooved rubber sole plates is very effective to reduce the shocks of vibrations caused by the trains while passing through the tracks.